» This is a … what exactly? This is a … what exactly? Is this just a tree with many thin trunks, or does the species have a name? And now for something completely different, a botanical mystery. Well, at least it was a mystery to me. I may have found a possible answer. But it might be wrong, so I could use some help. In reporting the news and writing about the real world around us, most of us call a tree a tree. That’s because we either did not take botany or paid no attention when we did, and to this day we have no clue. So a tree it has to be. So now here’s this curious little tree with many trunks. I didn’t wonder about it much until one day a few weeks ago it developed one solitary fruit. I turned to my trusted sources, which guide the reader by means of questions, mostly about the shape of the leaves: Does it have needles or leaves? If leaves, go to page such and so. In this way, both pamphlets led me to the conclusion that what I was looking at was a crabapple. This sounded like the right answer because that single fruit does look kind of like a litte green apple. But doubts persist. Why? Because my printed advisers maintain that crabapple leaves are “jagged-toothed,” and the leaves of this one don’t look that way to me. If anybody has a different idea from the photos alone, I’d appreciate it if you would leave me a note. I venture to guess it’s just an apple tree that sprouted from a seed instead of being grafted to a different root stock like most are. I’ve had a cherry tree do a similar thing. I’m not an arborist, but that looks like a Gravenstein apple to me. 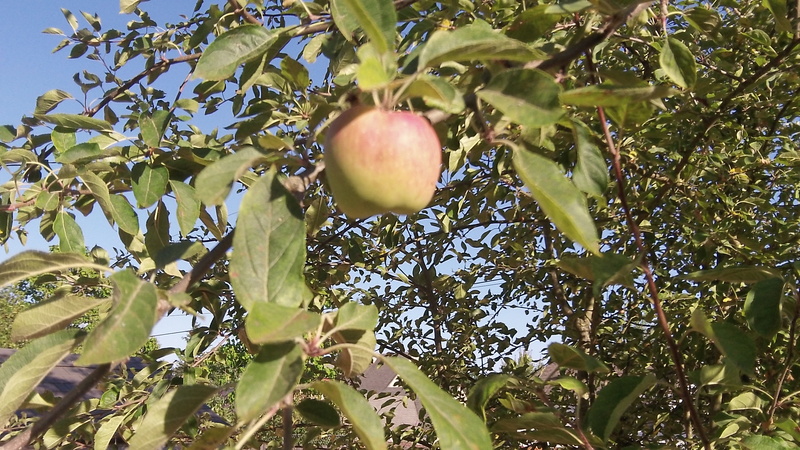 Gravensteins are a summer apple and are ripe now. Some apple tree varieties produce many suckers which could lead to that many stemmed shrub look without proper pruning. The fruit seems a little large for a crab apple. I have a theory about apple rootstock. Have you seen much of a bloom? Even if a tree blooms, you need bees at the right time. And other appropriate varieties to provide the pollen unless the one you have happens to be self-fertile. 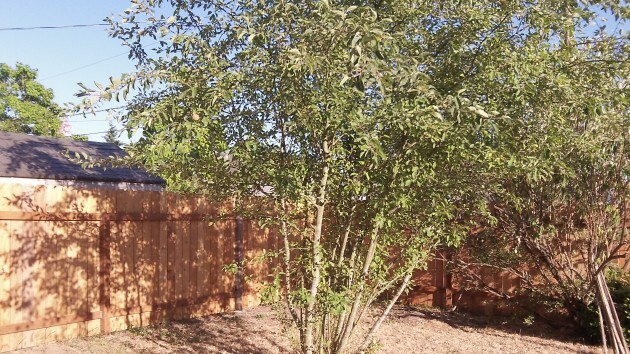 Maybe this tree/shrub originally had a friend and is now alone. The lone apple is perhaps just a random pollination event. I would say two ships passing in the night except that bees don’t fly by night. Most apples we eat are grafted. I suspect that your apple was a grafted tree when planted. But then the grafted part on top died, and the rootstock lived. Whoever was in charge of the property perhaps had no clue what it was and did nothing in particular with it. The original trunk and sprouts from near the base have all had a chance to grow without interference from some busybody with a pair of sharp Felcos. The rootstock apple could be consumable, but it is not likely to be great. We have an old old orchard on our property that was put in probably 60 to 80 years ago, maybe more. (Millers put it in, who donated the land for N Albany park. And, on another side note, our friend who recently died at 102 said he used to play on our property when he was a kid with the Miller kids.) Anyway, it was a jungle of other invasive species when I started clearing some of the junk out several years ago. To my surprise, I found some old fruit trees that survived in the jungle. There are variety of fruit trees including regular apple and crab apple. The crab apple fruit is pretty small (about the dia. of your thumb.) The birds come and eat them in the fall, but other than that, I don’t see that they are worth growing. And, by the way, I was told that you can not hardly kill a apple tree. I found this to be true after I severely cut them back and they are looking good now. So, that’s the report from this section of N Albany.